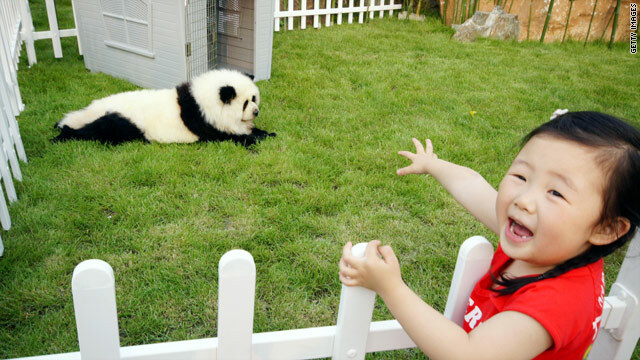 In China, a dog is painted to look like a baby giant panda. Overheard on CNN.com: Panda dogs: Cruel or cute? In many parts of Asia, attitudes toward dogs have come a long way. Ten years ago in Taiwan, they were still eaten in public places, but in China, a growing pet-pampering trend has come to this: dyeing dogs to look like pandas and other wild animals. CNN.com readers had plenty to say about the turnaround. Fashion designer John Galliano went on trial Wednesday, accused of making anti-Semitic comments against at least three people in a Paris cafe. French law prohibits the incitement of racial discrimination, hatred or violence based on a person's origin or their membership - or nonmembership - in an ethic, national, racial or religious group. Galliano faces six months in jail and a fine of 22,500 euros if convicted. So what did CNN.com readers think of his trial? Nearly everyone who posted agreed: Criminal charges seemed too harsh. Some readers took issue with what they saw as preferential treatment for members of the Jewish religion. mware09 added, “And anti-Mormon remarks are put on Broadway!" Mexican authorities captured the top leader of one of the country's most violent drug cartels Tuesday, officials said. Jose de Jesus Mendez Vargas, aka "The Monkey," helped expand La Familia's reach, and his capture is an "overwhelming blow" to the group, Mexico's national security spokesman says. But CNN.com readers seem to think the issue is more about legalizing drugs. US1776 said, “Until we repeal the drug prohibition this is meaningless. You want to end all the violence and tens of thousands of killings? Then start demanding the end to the drug prohibition." yoal said, “Explain to me this, if all drugs get legal, WHO IS GOING TO MANUFACTURE THEM?, you want to legalize the cartels?, give even more power to the pharmaceutical industry?, or create a new even bigger monster companies capable of corrupting politicians to follow their agenda? rtgunlimited said, “Demand is not going to go away JDCNDE. People could have "just stopped using" alcohol too, but they didn't want to. This is the same." I have to laugh at all the "activist", "animal rights", people.. Its 2011.. GET A GRIP! Have you NOTHING better to do, than to worry about some mutt with a nifty new hair doo? I will go out on a limb.. and BET, there are issues in each of your cities or towns that are MUCH more important, and MUCH more in need of attention and concern. Additionally.. I will BET, than not ONE of you are doing ANYTHING to make a difference in your own neighborhoods.. It is almost certain, that you all look for some "world atrocity" to voice your displeasure. Go dye your hair, get cosmetic surgery, sing folk songs, smoke weed, and save the planet with your Prius. And for the love of GOD, hug a tree and continue to make fools of yourselves! How's that "...make a difference in your own neighborhood..." workin out for you? I can understand the concern for the dog but stop making blanket remarks about how backward/cruel/uncivilized Chinese are on this ridiculous issue. I'm more appalled when people dress up their 7 yrs old and drive them all over the country to beauty pageants or marry their 16 yrs old to 51 yrs old actor. I think those parents are fools but I'm American so I understand the vast majority of Americans are not like that so I don't condemn the whole country because for it. As for wasting money don't even go there. We could all be shopping at Walmart and drives a KIA to feed the hungry right? So why are there so many malls in the USA selling $200 leather purses and BMW and Mercedez all over the place? So long as the dying process doesn't hurt the dog I don't see a big problem really. It may sound a little nutty to us, but as some others have noted, here in the states we neuter dogs, cut their tails short, prune them and their hair in various ways counter to their natural look, put them in collars they wear all day, and make them eat what seems like disgusting kibble. I think we all should look toward kinder treatment toward animals, which includes our pets, the meat we eat, and the animals that are effected by us living on this planet, but in the scheme of things making a "Panda Dog" doesn't seem like a huge crime, if you have a loving family otherwise. The must be hot in that thing, let the dogs live normally you cruel beings. I find it ironic that someone can fervently object to (probably harmlessly) changing the outer appearance of an animal, but at the same time will make sweeping statements entrenched in racism. Get off of your high horse; just because you're "American" doesn't make you well versed in ethics. Just because they're Chinese, doesn't mean that they're ethically corrupt. You cannot advocate for animal rights if you can't even understand the basic human right of acceptance as an individual. Oh My Gosh Folks... Women & now men are dying their hair regularly. Are humans not animals by definition? Dying fur or hair is no biggie. And no it never stung my eyes. There are more important issues in our world than cute cuddly pets with a dye job. Get over it already and move on to vets living on our streets, hungry people, cold elderly, etc.